5' A brand NEW tree and a brand new concept in Japanese Flowering Cherries.The first truly dwarfing member of this group of trees and just ideal for the smaller bed, flower border and of course the patio container. 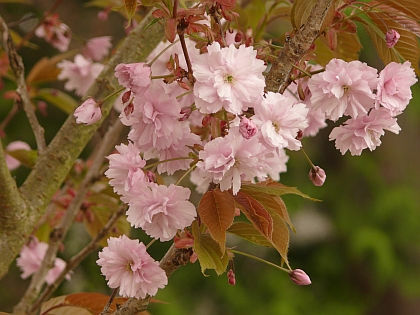 Little Pink Perfection is a perfect scaled down version of the true majesty of the Japanese Cherry with the same large, luscious, fully double pink flowers all along the branches in mid Spring. The foliage colours beautifully in the Autumn, all this on a tree which naturally only grows to around 6' and with no pruning. Easy to care for and grow, we feel this will revolutionize the way flowering cherries are utilized in British gardens and we understand more varieties in dwarf are to follow. SOLD OUT.